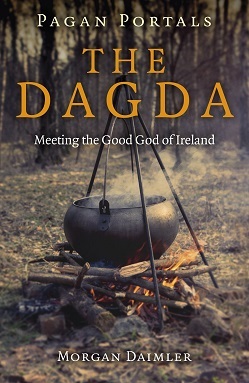 The Dagda, the Good God of Ireland, is the subject of the book written by Morgan Daimler. She has created a beginner’s book on a Deity that is multilayered and complex. As of 2017, the time of the writing of this book, the author, Ms. Daimler had not heard of a book that was written solely on the Dagda. The author, Ms. Daimler, has broken the five different chapters up into sub-entries. Each entry deals with a different aspect of the Dagda. Even though there are only 77 pages in the e-book, I found myself taking a lot of notes. The first chapter describes the Dagda, in name, physical description, and in his relationship with others. The second chapter is the mythology of the deity known as the Good God, the Dagda. There are several different myths that Ms. Daimler uses; most of which have Irish titles that I can’t pronounce. (My pronunciation of Irish words is terrible so that my program that does my typing would misspell all of them anyway.) All of the myths that Ms. Daimler used as references showed the Dagda, as a God of many skills, abundance, and healing. In chapter 3 one of the possessions that belong to the Dagda, is a cauldron of abundance. In modern neopaganism, the cauldron is often associated with feminine or goddess energy. In Irish were more generally Celtic mythology the cauldron is associated with Gods. Also in chapter 3, she talks about herbs, trees, and resins. She does point out that herbs are a bit more modern and vary from person to person. Oak has always had a strong connection with the Dagda. Also having an association with the Dagda are frankincense and myrrh, neither of which are native to Ireland. On page 51 of Ms. Daimler’s book she talks about the Dagda has a strong modern reputation as a Druid or working druidic magic, but she points out that there is nothing explicit in the mythology the connecting to the Druids. She does think it’s redundant that the Dagda has his own Druid. She says it’s redundant, if he, himself was also a Druid. I don’t think it’s any more redundant, then a tarot reader going to another tarot reader for a reading. There are a couple of different things that Ms. Daimler includes in the book that I find interesting. One of the sub-entries is the Dagda in my life; I like when an author includes their working with a Deity or part of their own spiritual growth experience. She also includes a look at the Dagda in the modern world. I do see this book as a jumping off book for learning more about the Dagda. I think some of the sources that Ms. Daimler quotes, will lead others to search more about Celtic myth. I’m glad to have read this book because it gave me a deeper understanding of the Dagda, and the way Irish/Celtic myths look at their deities. I highly recommend this book.